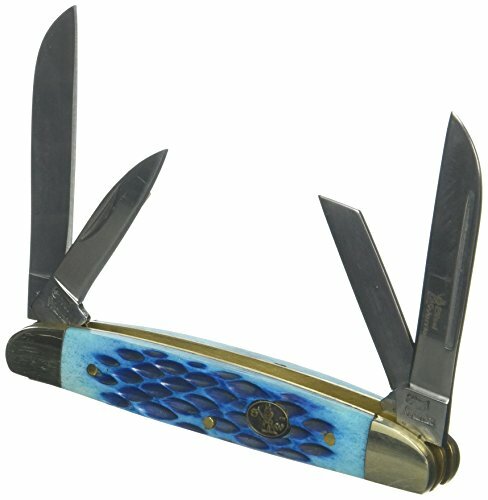 Steel Warrior, Bent Creek Congress, 4 Blade Pocket Knife In Cancun Blue Jigged Bone Handle Finish, 3-1/2" Closed, Has A Real Bone Handle, Real Brass Pins, Real Brass Liner, Nickel Silver Bolsters & 440 Stainless Steel Blade That Is Rockwell Tested To 56-58 Hardness, Steel Warrior Brand Knives Possess All The Key Features A Well Made Traditional Style Pocket Knife Needs, Guaranteed For Life Against Manufacturers Defect, Blade Lengths 2.00", 2.00", 1.50" & 1.50". If you have any questions about this product by Frost Cutlery, contact us by completing and submitting the form below. If you are looking for a specif part number, please include it with your message.